INFINITI of Modesto is proud to serve the Modesto region and neighboring Tracy, Merced, Turlock and Fresno, with quality new and used INFINITI vehicles. With models like the Q50, Q70, QX60, QX70, and QX80, we have something for every taste and every need. Come visit us to see our new and used cars and take one for a test drive. If you’re looking for Modesto used cars, we can assist you there as well. Visit our inventory page to see the large collection of pre-owned vehicles to select from including used Cars, Trucks, and SUVs. 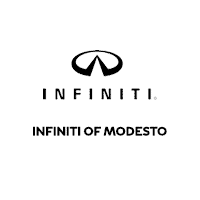 INFINITI of Modesto is not just a good choice as your Modesto INFINITI dealers, we also provide a full line of services dedicated to our Modesto, Tracy, Fresno, Merced and Turlock, CA customers. From auto repair performed by expert mechanics to OEM INFINITI auto parts and accessories to car loan assistance, INFINITI of Modesto is the smart choice for your next vehicle or other automotive needs. Come in and say, “Hi”. We’re located at 4130 McHenry Ave, Modesto, CA, 95356 or you can call us at (209) 225-2705. We look forward to your visit.